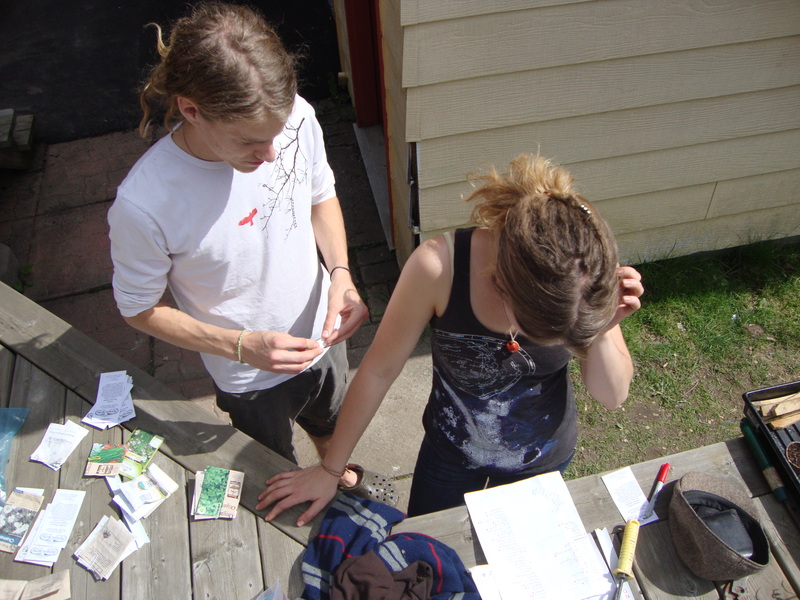 This past summer of 2012 was one of the most awakening and deeply enjoyable garden experiences of our lives. Between the two of us, we both spent extensive time digging, sweating, planning, planting, watering, weeding, and exploring our new backyard organic garden. The entire project began with a rich yearning to till the soil in the backyard’s green grass monoculture. We are both expanding in our knowledge and experience with gardening and being self-sufficient so growing our own food and medicinals was a clear next-step for personal growth. 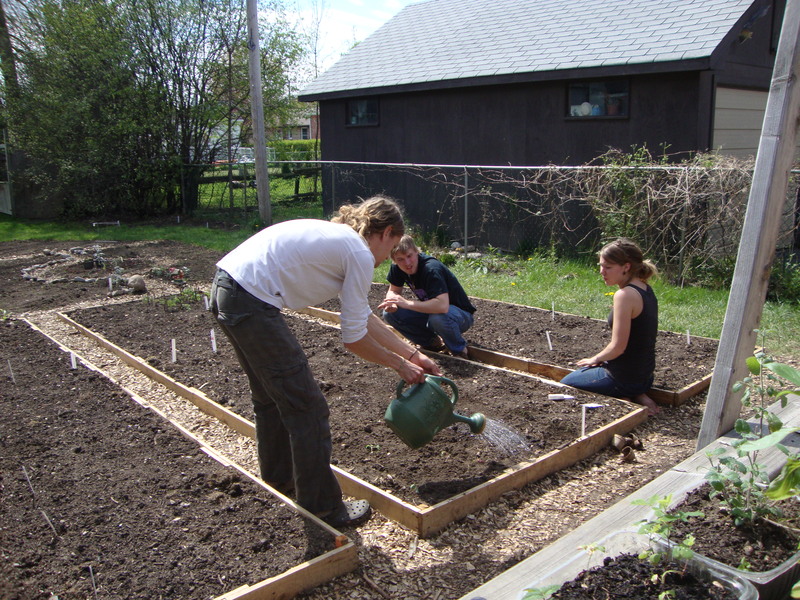 Actually, in my opinion, the best thing to do if you are not confident or not sure when/where to plant a garden, would be to just start with a small garden plot, pick out the plants you want to use, do basic research (even just on the back of the seed packs about which month to plant or how much sun/water), plant them in the spring, and watch them grow until they are ready to harvest! It is as simple as that. I cannot guarantee you will be successful with what you try to grow, but at least you observed, learned, and can take that knowledge to improve and build upon the mistakes you just made. In our case, we both had some farming and gardening experience so we were not really starting at the bottom but after planting 60+ species of plants and not knowing exactly what grew best where, or which needed extra care or sunlight, as well as the quality of our soil… it all became a little wrenching to see if ANYTHING would grow. This was our best lesson; almost everything that germinated did amazing and we had tons of success with things like Butternut squash, which grew 17′ vines that crawled the length of our garden beds and produced seven 5+ pound squashes! The only major problem we had was with cucumber beetles and tomato blight- it was a very bad summer for that indeed. 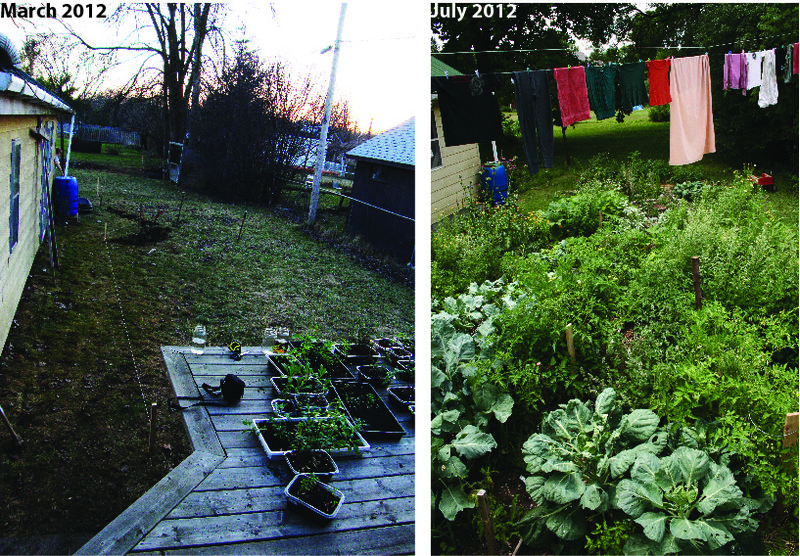 Our indoor garden we made last winter and blogged about, started off the 2012 season. Many of our herbs were started inside and that allowed the roots to flourish and get a head start. We then hardened them off in the early spring as we began the immense and tiring task of plotting out our future garden and tilling the soil all by hand! We mapped out a space a little under 1300 sq. ft and removed the sod, and tilled about 12″ deep to loosen up the topsoil once the ground had dried from the receding frost. You can also see the full layout of the 2012 Garden here. We had only started our compost the fall before which forced us to purchase a half pick-up truck load of leaf and mushroom compost to use for adding nutrients to the dry topsoil. Instantly, the soil went from a light grey to a dark black earth, with much greater moisture holding abilities. warm, sunny summer day). We dug a large trench around the perimeter of our compost and shaded garden because in the past the rain load emitted by the garage roof swamped out the garlic and spinach planted near our path. After digging the trench and filling it with large crushed gravel, heavy spring rains washed into the deep trench and by-passed the beds and flowed into the corner of our property. One other project we completed before the season began was the digging of a small toad pond near the interior of the middle garden. We found 3 very small toads while doing maintenance gardening for a customer, and brought them home to live for the summer in case they got hit by her lawnmower. We only saw them from time-to-time but it was the hornets that we observed making frequent visits to the pond to collect water to drink, or to take to their hives. Another friend of the garden was the giant fuzzy bumble bees, burrowing their nest in the soil next to our potato mounds. In the early morning as we toured the gardens before work, we would pass the potatoes and witness a scurry of 5-10 big bear-like bees buzzing past; off to collect nectar. Check out part two of this blog (hopefully in the next day or two) to hear about our planting, harvesting, and finally putting the garden to sleep last fall!